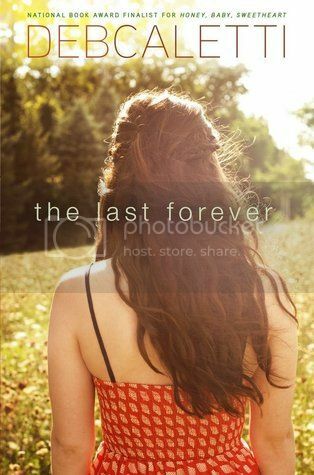 The Last Forever is the very first novel that I’ve read by Deb Caletti. I’ve heard nothing but good things about this author, so I was super excited to get started on this book. After being forced to go on a spontaneous road trip by her grieving father, Tess ends up in her grandmothers small town of Parrish Island. Even though she feels lost and alone, especially after her dad deserts her, she starts to feel welcome in this small town. With the help of the people she meets along the way, she learns that in life, nothing lasts forever. Tess was an interesting character. I can imagine the pain that she is going through after the loss of her mother, and I can definitely understand the grief. Because of this, she seems very closed off in the beginning of the novel. But once she starts meeting new friends on the island, we finally start to see a different side of her. Henry Lark is the love interest in the story, and he was a very sweet young man, very gentlemanly as well. I found him to be the highlight of the book. He does have a secret throughout the book that turns out to be a pretty big plot twist that I didn’t see coming, but I still love him nonetheless. All of the secondary characters in this novel were pretty interesting. Tess’ grandmother, Jenny is quite the character. And while it took me a while to warm up to her dad, because honestly he needed to grieve himself and grow up as well, I ended up loving him as well. There are so many more characters that I could mention, but I will just leave it at that they were all pretty funny people. I also really enjoyed the world-building in this novel, even as simple as it was. The small island town seemed very warm and inviting, and most of the story was set in a library. I LOVE books that have libraries in them! Overall; The Last Forever is a story of love and loss and letting go. I think that it will be a book that a lot of girls will love, and will be able to relate to. I love books that have libraries in them, too. Must be the bibliophile in us! Henry sounds like a fantastic character, one we need more of (yes, I do love a good book bad boy but...good guys are who I truly fall for).